This is a half empty/half full story, with Retrevo playing up the “I’m no longer interested” angle a bit too heavily. 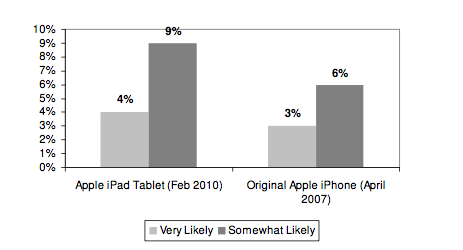 I had always believed the iPad would sell after consumers got chance to see and fondle the device. There were also competing surveys indicating high levels of interest among consumers. 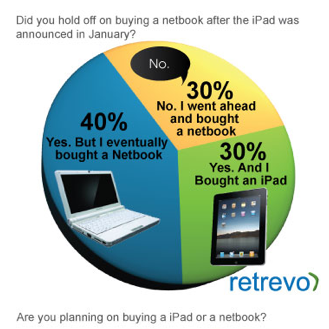 These data come out of a larger analysis that reflects the decline (at least in the US) of netbooks. According to one financial analyst’s estimates iPad production is cranking along at 1M to 1.5M units per month and might go as high as 2.5M units. At that rate, we’re probably looking at iPad sales of nearly 7M by the end of the year, not counting international. However that momentum could be interrupted if super-cheap “good enough” Android tablets hit the market in the second half. Once again I’m facing a mobile phone dilemma. Although a Sprint customer for over 10 years I’m perpetually flirting with leaving, either for the iPhone or cheaper comparable service from T-Mobile. I bought the Pre, buying the hype, only to discover its profound limitations as an Internet device — especially compared to the iPhone. I’ve also owned or extensively tested several Android phones: the HTC Magic/MyTouch3G, the Nexus One and, now, the HTC Incredible. Maybe it’s because I’ve already used the N1, or potentially because I now have an iPad, but I’m unimpressed by the Incredible. That’s right; I may be the only one. I like the N1 better. It felt more substantial. I also find I’m not a fan of the HTC “Sense” interface. And it’s no longer as “fun” to browse the Internet on a smartphone after the iPad. Android devices have gotten better and better but they still don’t trump the iPhone in my view for overall ease of use and functionality. There are a number of things that are nicer on Android than the iPhone but the “fit and finish” and certain aspects of the UI and general usability don’t measure up. As one example, the HTC Android keyboard remains weak by comparison. What I’d really like is an iPhone on Sprint (or Verizon). But it doesn’t appear that one will be forthcoming for some time (maybe until 2012). Regardless of the existence of an exclusive deal this is a bonehead move for Apple. Verizon is selling Droids two for one right now. I’m now looking at the Evo (the first 4G phone) from Sprint. The additional speed would be a benefit but most actual speeds will not reach true 4G. If I’m honest I feel a sense of disappointment when I consider extending my contract for another two years for this device. But I don’t want to switch to AT&T. 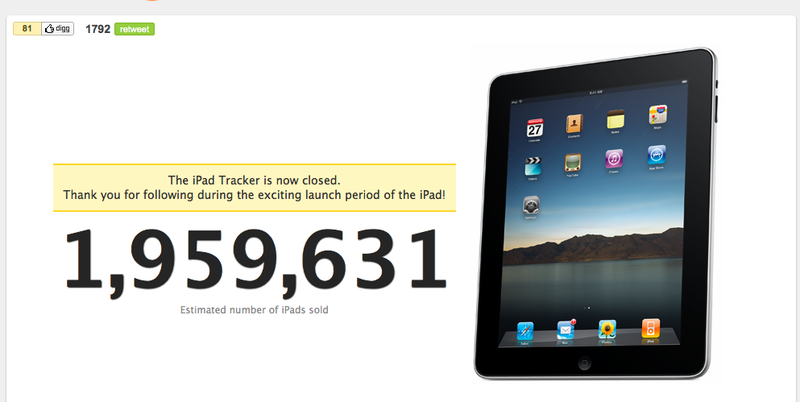 Has the iPad Already Sold 2 Million? Chitika, which correctly estimated that 1 million iPads had been sold before Apple formally announced the milestone (earlier this month), shut off its iPad tracker several days ago at 1.95 million iPads. If these figures are accurate it’s semi-amazing that only a couple of weeks after the one million announcement Apple would have doubled sales. Posted in Hardware, Mobile | Comments Off on Has the iPad Already Sold 2 Million? Apple is now shipping the iPad 3G, which should trigger another wave of sales for the now popular device. Meanwhile, curiously, HP has reportedly killed the much-hyped (Flash, “full Internet”) “Slate” tablet previewed by Microsoft CEO Steve Ballmer at CES earlier this year. My belief was that the HP Slate was destined to fail as simply a netbook without a keyboard. HP’s acquisition of Palm and WebOS was undoubtedly directly related to the decision. Microsoft had previously denied the existence of the device. It looked “cool” and innovative so it’s too bad it won’t come to market. But there will be numerous other tablets (especially based on Android) coming out later this year. The netbook market perhaps has “peaked” and tablets will potentially be taking their place (depending on several factors). Android tablets may (emphasis on may) be able to go “head to head” with the iPad on features and UX, but many of these devices will have to compete on price, which several computer OEMs have indicated they’re going to do. The success of netbooks during the recession has brought the price of laptops down overall. It’s now hard to charge much more than $5oo or $600 for a laptop unless you’re Apple. A bunch of $250 tablets may put additional pressure on the PC market. But Apple will also be forced to lower iPad prices if competitiors are successful with lower-priced tablets. All that remains to be seen. Update: Got a note from someone “in the know” who disputes that HP is killing the Slate. We’ll see. Could the iPad Get Better PR than This? This is apparently now going viral, evidenced by me putting it up here in part. The video below features a 100 year old woman named Virginia who bought her first computer: an iPad. . .
No I don’t think the association of the centenarian with the iPad will scare away younger users. In one corner is Adobe and its rageful supporters: “F-U Steve Jobs and your damned closed system!” In another the tech fetishists: “Why doesn’t the device have this and that and several other components?” Then there are those who love it (like me), and still others who like it but see it as the death of books (it’s not). It’s fascinating to watch all the bile as well as the speculation about how the device will impact computing. Of course, it already has. My belief is that the iPad launch (maybe Kindle too before it) will stand in retrospect as a “watershed moment” in computing, just as the iPhone launch dates the beginning of the “mobile Internet.” Indeed, the Internet is more and more about mobility; the iPhone started the movement and the iPad accelerates the trend. The iPad and maybe its future imitators offer a tremendous potential boon to traditional magazine and newspaper publishers if they don’t blow it. 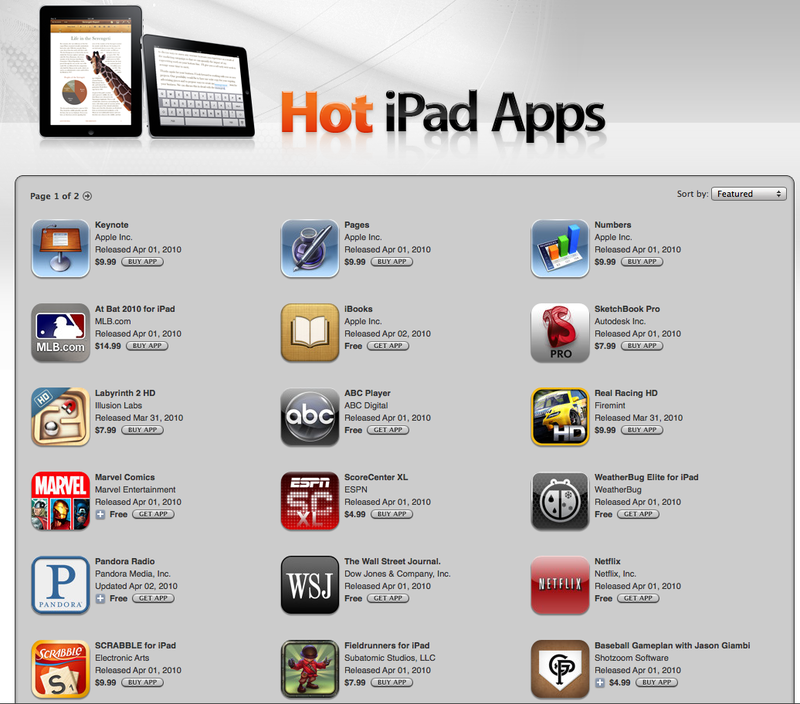 Without exception they should develop iPad apps that really optimize the experience for the device. 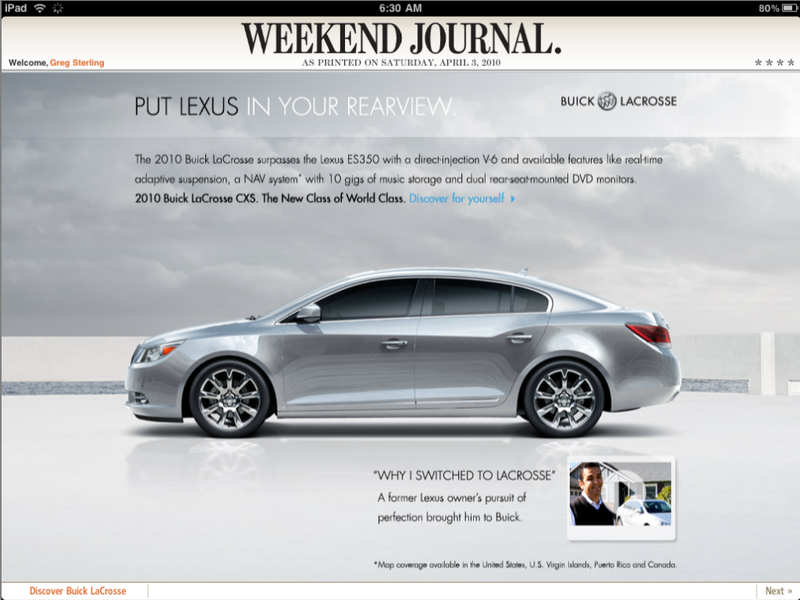 If they get it right and the pricing too they’ll be able to reap subscription dollars from the iPad. People will pay, I’m convinced, for great content well presented on the iPad while they remain unlikely to pay for PC-based content subscriptions. The art however will be in the pricing. H.P.’s version of the iPad is expected to be released by midyear. Notably, it will have a camera, as well as ports for add-on devices, like a mouse. Also, it will, the company says in a promotional video, “run the complete Internet,” including videos and other entertainment. Phil McKinney, the chief technology officer in H.P.’s personal systems group, said in a recent interview that the company had been working on its tablet for five years. It delayed releasing the product, he said, until the price could be lower. This “complete Internet” strategy is misguided and the product will fail, unless it’s dirt cheap and/or totally capable of replacing a laptop. If it is a cheaper-than-a-netbook laptop replacement some people will buy it. If it comes in below $300 people will buy it. But HP, from what I’ve seen so far, doesn’t “get” what this new tablet experience is about. Sure it’s about the Internet but its mainly about a new way to consume content that’s redesigned for a tablet — specifically. The Internet is an efficient but ultimately horrible way to read the NY Times. And while the NY Times has a sub-optimized iPad App it’s already a much better experience than the conventional Internet. The app is king of this new realm. And that’s what an HP, or Acer or Dell don’t fully recognize (yet) and can’t compete with. These companies can produce good devices that are more convenient and “personal” than a laptop — and some of them will — but no matter how many ports and how much Flash are on these devices they’re unlikely to trump the iPad. I could be proven wrong but I don’t think so. Android will be interesting to watch. Just as the inaugural Android device was shifted from a BlackBerry clone to an iPhone imitator, Google’s Chrome OS/netbook strategy is probably shifting as we speak. There were a couple of Android tablets before the iPad (though none successful). However the ultimate realization of Google’s Chrome OS cloud strategy will be a tablet that perhaps runs Flash as well as Android apps. Google had planned to put out Internet-books by Thanksgiving 2010 but I suspect now we’ll see a few tablets as well. Those who haven’t lived with the iPad for several weeks but critique it don’t really know what they’re talking about. The smug “I’m waiting for version 2.0” crowd is also missing out. Sure it’s a luxury item but it’s a great (and of course imperfect) device that in most respects is a lot more satisfying to use than a PC or a smartphone. 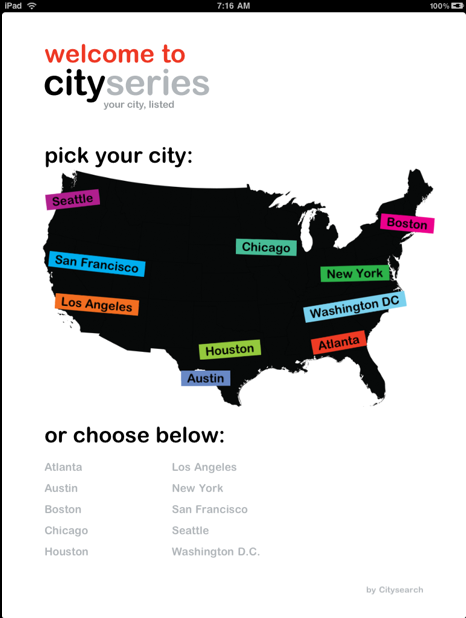 Cityseries allows users to find the best restaurants, bars, shopping, spas and more in top metros, based on the acclaimed advice of Citysearch editors and expert users across the United States. 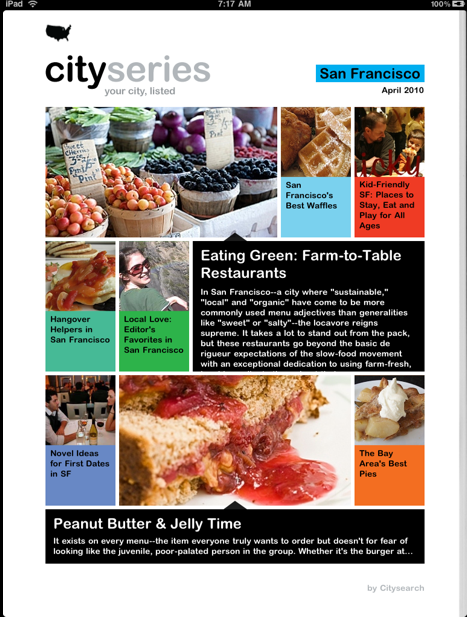 The new app features Citysearch’s top lists, great picks complete with business profile information, and local deals in a new innovative digital magazine format that allows users to review recommendations and discover new businesses. This is a great idea. But the execution right now falls a bit short. The content needs to be beefed up and some additional things need to be “tweaked” to make this truly useful and engaging. But it’s an interesting start and effort to make the leap from iPhone app to iPad. 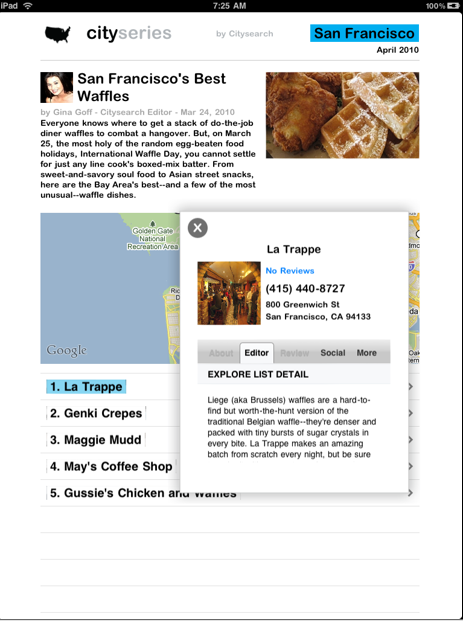 Citysearch has much more content that can and should be included in an iPad “magazine” such as this. However there’s an interesting model and a great deal of potential here. Apple today announced that it sold over 300,000 iPads in the US as of midnight Saturday, April 3. These sales included deliveries of pre-ordered iPads to customers, deliveries to channel partners and sales at Apple Retail Stores. Apple also announced that iPad users downloaded over one million apps from Apple’s App Store and over 250,000 ebooks from its iBookstore during the first day. These are strong numbers but less than the increasing numbers put out over the weekend, which I had believed too (600 to 700K). By comparison, Apple sold one million of iPhone 3GS devices during the first three days of that phone’s launch. The original iPhone sold one million in 74 days. For the launch of the 3G version the handset’s price was basically cut in half. The iPad has outperformed the original iPhone. But a price cut and/or the addition of new features in a iPad 2 will likely result in a similar bounce for sales. As of March 16 there were 135K Nexus One handsets sold, according to various reports. The iPad is a strangely compelling device I’m discovering, less than a day after picking it up from my local Apple store. It’s at once familiar and very unfamiliar, like someone you think you’ve met before but can’t figure out where. 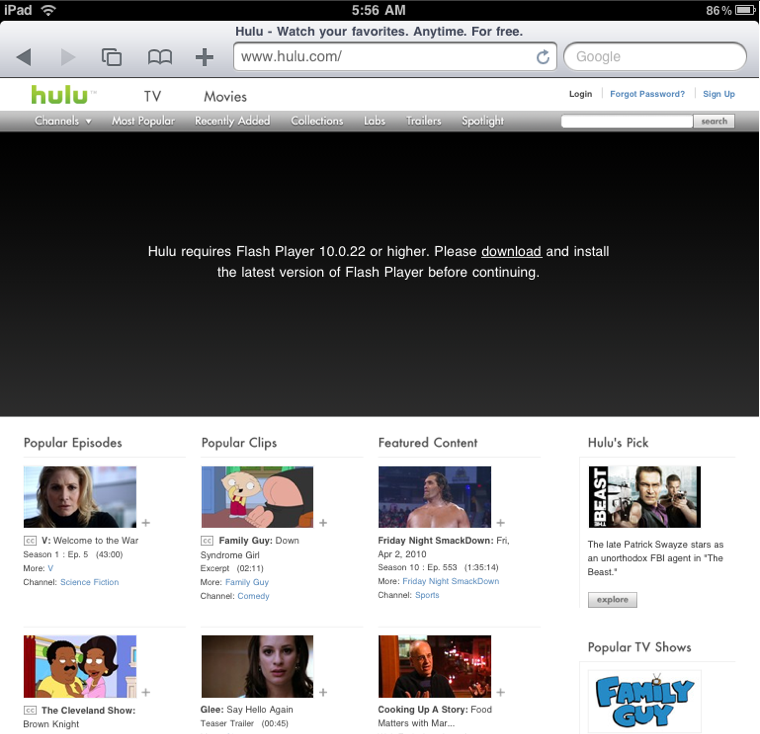 But Netflix compensates for Hulu’s absence. And YouTube works too. 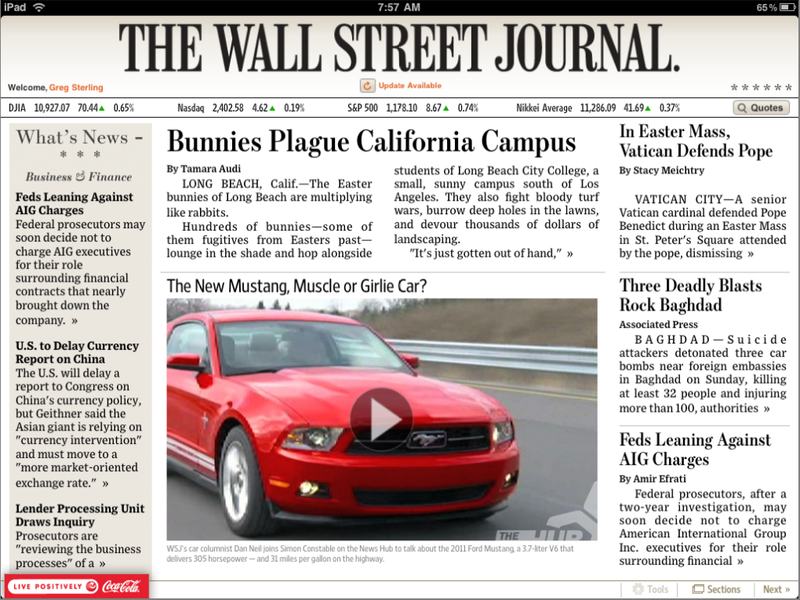 Beyond Netflix, which is the device’s first “killer app” in my view, the best of the media apps I’ve explored so far is the one from the WSJ. It’s a much fuller digital realization of the WSJ than the PC version of the site — ironically because you hold it as you do the paper and because it can look (and act in a way) more like the physical paper. Every magazine should probably be considering building an iPad app. As everyone has said this is primarily a media and content consumption device rather than a content creation device — though apps such as Brushes and a few others contradict that early assessment. I would still rather write a blog post on my Macbook than on the iPad, though it’s possible to write one with the WordPress app or just through the traditional browser-based interface. Indeed, the Internet browser experience via the iPad is much more satisfying than the iPhone and other smartphones, and in many ways more satisfying than on the PC. I also really like iBooks and the way they’re presented. Others have criticized me for this, but I like the page turning simulation that it offers rather than a pure electronic rendering of the text. The device is also very fast. Many people have commented on this but it’s a striking feature of the tablet, as is the beautiful screen resolution. As I speculated yesterday, the iPad is not an “on the go” device. You’re not going to walk around the streets of New York with it. Much like the PC, you’ll use it to help make choices of where to go or what to buy (in the future) in the real world. However the fact that its screen is large and you can carry it with you on the bed, in the bathroom, on the couch is what makes this such an interesting and compelling piece of aluminum and glass. It’s too early to tell but the iPad has an aura of leisure around it. I spent this morning reading the online version of the NY Times in my kitchen on the iPad and answering email. GMail on the iPad, by the way, is very nicely done and very satisfying. I haven’t done enough with it yet to know how it fits in to my digital activities entirely. I can tell you however that it has displaced my iPod Touch already, which had taken the place of my PC for many tasks. I have to say that the device, in the end, is “unnecessary” — but then so was the iPhone. I will be traveling to the Apple store in beautiful Emeryville, CA later today to pick up my iPad, which I reserved rather than purchased online — mostly to give myself more time to decide if I really wanted one. I had an interesting conversation on Friday with Trulia CEO Pete Flint about whether the device could be considered a “local” device. In my view all digital media has a local aspect (especially in a commercial context) in the sense that they drive offline purchases. However, it’s a very different use case than a smartphone. Trulia competitor Zillow is already out of the gate with an iPad app. Among the nascent top apps, there are no “local” ones. As with the PC or laptops, iPad owners will be doing location-based searches and shopping, which ultimately is about the offline world. The clear distinctions between local and non-local will blur further and even collapse over time. Case-in-point: Skyhook Wireless’ new API that adds location and related maps and pages to any mobile app. NearbyNow’s Scott Dunlap told me last week about some pretty interesting stuff they were cooking up for the iPad that enhances and extends what they’re already doing: linking brands and products in magazines to stores where they can be purchased. I must admit to being excited about the possibilities of this new “form factor” and even by the uncertainty of how people will use it. Apple iPad Pre-Orders Better than Reported? After the initial burst of excitement on Friday that saw iPad pre-orders coming in at the rate of 25,000 per hour, there was a dramatic fall-off over the weekend. “That number is low,” says an industry analyst who is independently monitoring the iPad sales. The analyst, who is collecting sales data for clients and asked not to be identified, says the current tally is conservative and actual iPad sales are significantly higher. 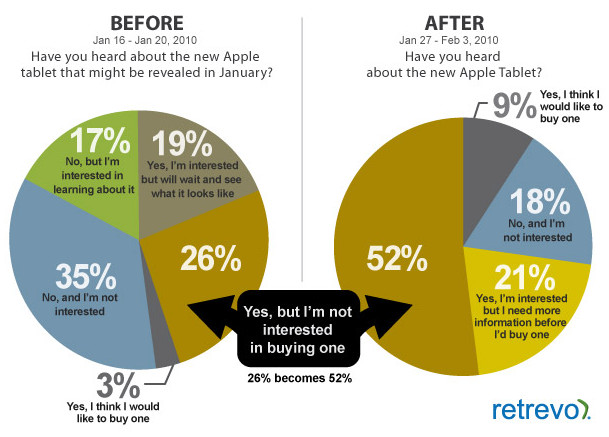 The analyst declined to offer an estimate however . . . .
Another analyst who says he’s not authorized to speak publicly about the Apple iPad says we are seeing a great deal of pent-up demand for the iPad. He says the enthusiasm is so strong that he expects Apple to announce it has sold 1 million or even 2 million iPads when the device becomes available on April 3. Enter the hall of mirrors . . . Even though there’s lots of skepticism there are also lots of high expectations for the iPad. I’ve reserved one for in-store pickup on April 3 and, since I didn’t pay already, I can let someone else have it if I decide to wait for version 2.0. Just giving myself the option . . .
Related: Samsung to release slate PC. I’ve been in a number of conversations of late where people are pretty polarized over the question of whether the iPad will be a hit or a bold swing-and-a-miss. My view is that it will start slow and then eventually become a big hit as people actually get a chance to hold them, see the screen resolution and want one for themselves. Many people are disappointed that the iPad wasn’t simply a flat-screen version of a Macbook. And to that end many computer OEMs are putting PC operating systems and chips on slate computers. I think that Apple is being smarter with its approach to the iPad. A touch-screen slate computer that isn’t aggressively discounted is just going to be a disappointing or weaker version of a laptop. What Apple may have created in the iPad is distinct category that has distinct use cases and functionality — this is what Apple clearly argues — although it’s missing some of the features and capabilities that some had hoped for. Lots of survey data have come out and can be read in a half-full or half-empty way. 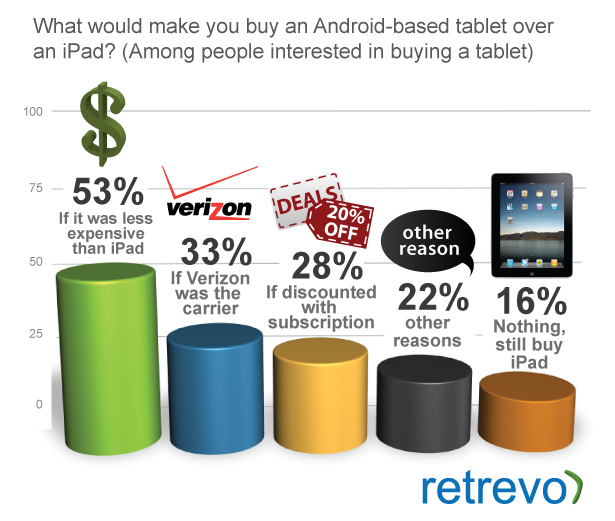 For example, AdMob’s recent survey data show “only” 16% of iPhone users are interested in buying the iPad. And an earlier Retrevo survey showed 30% of respondents (n=1,000) were interested in the device, although the Retrevo post about the data plays up the “negative” side of results. Developers and publishers of all kinds are preparing (or considering whether to prepare) for its release into the market. I think it’s ultimately going to be a hit but what do you think? Do you think it will succeed or fail? 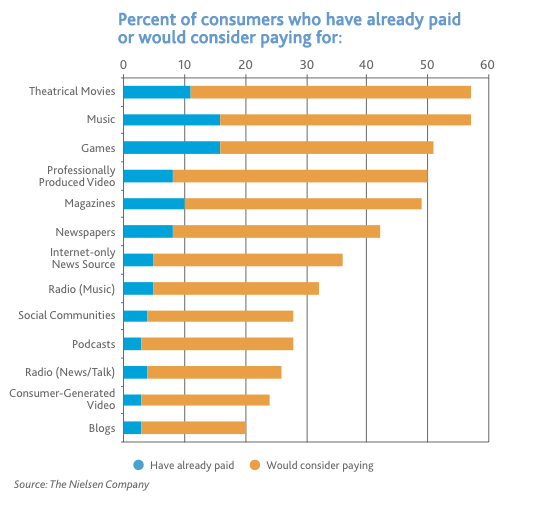 The latest in a series of these types of surveys about whether consumers would pay for online content, Nielsen polled “more than 27,000 consumers across 52 countries” and found at least a potential willingness to pay for some content types. Better than three out of every four survey participants (78%) believe if they already subscribe to a newspaper, magazine, radio or television service they should be able to use its online content for free. At the same time, 71% of global consumers say online content of any kind will have to be considerably better than what is currently free before they will pay for it. As a group, they are ambivalent about whether the quality of online content would suffer if companies could not charge for it—34% think so while 30% do not; and the remaining 36% have no firm opinion. But they are far more united (62%) in their conviction that once they purchase content, it should be theirs to copy or share with whomever they want. Despite that grim bullet, these findings overall provide some “hope” to publishers and traditional content producers that under the right circumstances they’ll be able to charge something for the digital versions of their content. We’ll see if tablets and the iPad have any impact on this. Most publishers will need to employ the carrot and the stick rather than just the stick to gain digital subscribers. We’re likely to see the greatest sales at the low end ($499) — the WiFi but non 3G version of the device. WiFi does location but won’t have a GPS chip like the 3G version. Most people who buy the device will be affluent consumers who already have smartphones. They’re unlikely to use it instead of a smartphone. It will be used in a complementary way. It may “cannibalize” some smartphone usage here and there. Aside from business travelers, most of the usage is likely to be at home, around the house, in my view. So in that sense it may not be primarily a “mobile advertising platform” in the sense of an “on the go” device. The device, somewhat ironically, offers the greatest opportunity for traditional media to express itself in digital form. It’s a device that can best reproduce the experience of viewing/reading/consuming the traditional product: better than the web and better than smartphones. 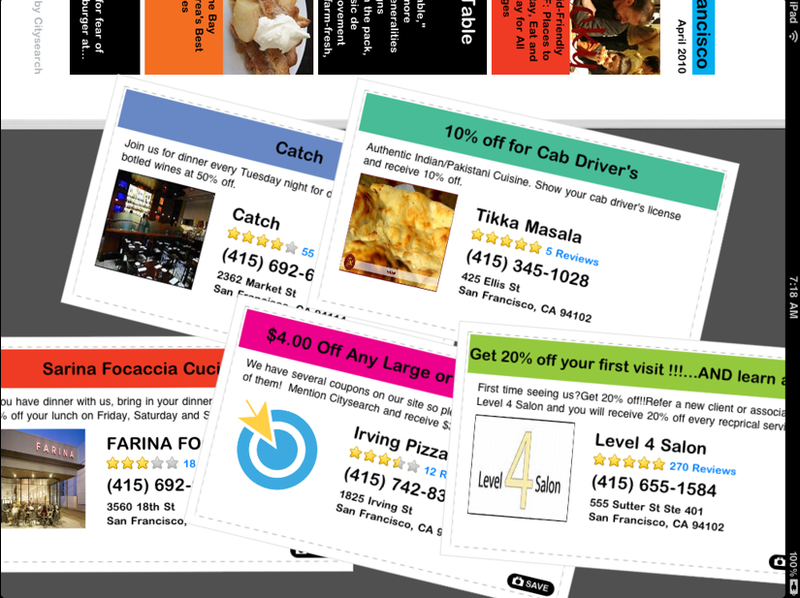 But it offers all the “benefits” of those devices in terms of interactivity and ad targeting. It’s too early to predict the use cases fully but it will be interesting to see them develop. In terms of sales there will be a slow build and then its momentum will gain as people see them and hold them. There will be lots of “lookie-loos” in the Apple store fondling these device for months before people start to buy. That’s where Apple’s retail locations really shine. If people read about — even see pictures — of the device without actually touching it they’re less inclined to buy. But holding it and seeing the screen will make people want one. 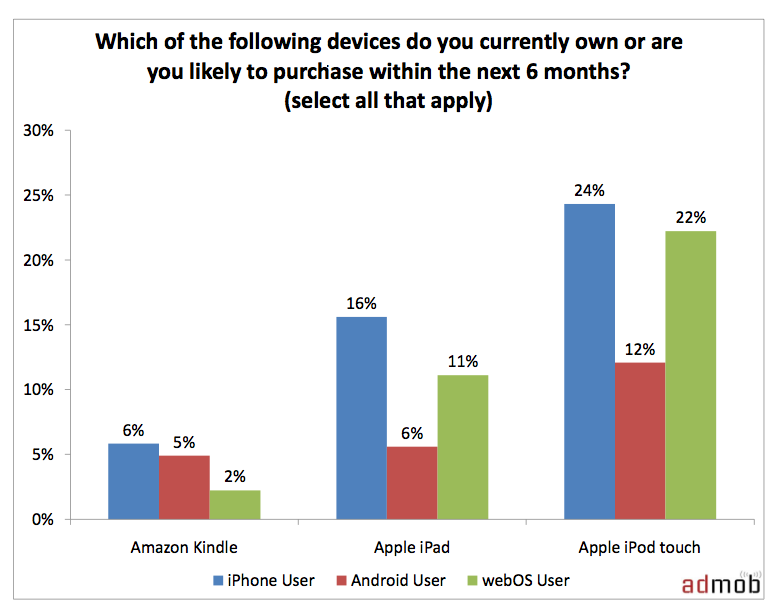 Previously I posted some third party data on demand for the forthcoming Apple tablet. For example, ChangeWave found that 18% of just over 3K US consumers surveyed said they were somewhat or very likely to purchase the device. Independently Retrevo found that $700 was the top price point for most people interested in the device. 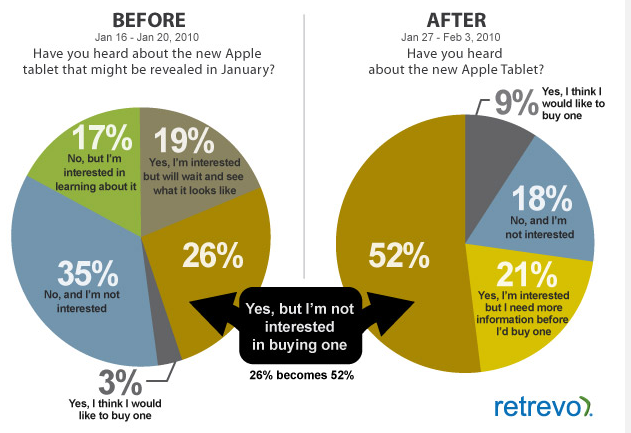 Nearly two-in-three U.S. consumers (63%) expressed interest in an Apple tablet, with 21% expressing strong interest, above the initial level of consumer interest SRG found for iPhone around the time of its release. Men and women appear to be equally interested and 82% of very interested prospects are under 50. 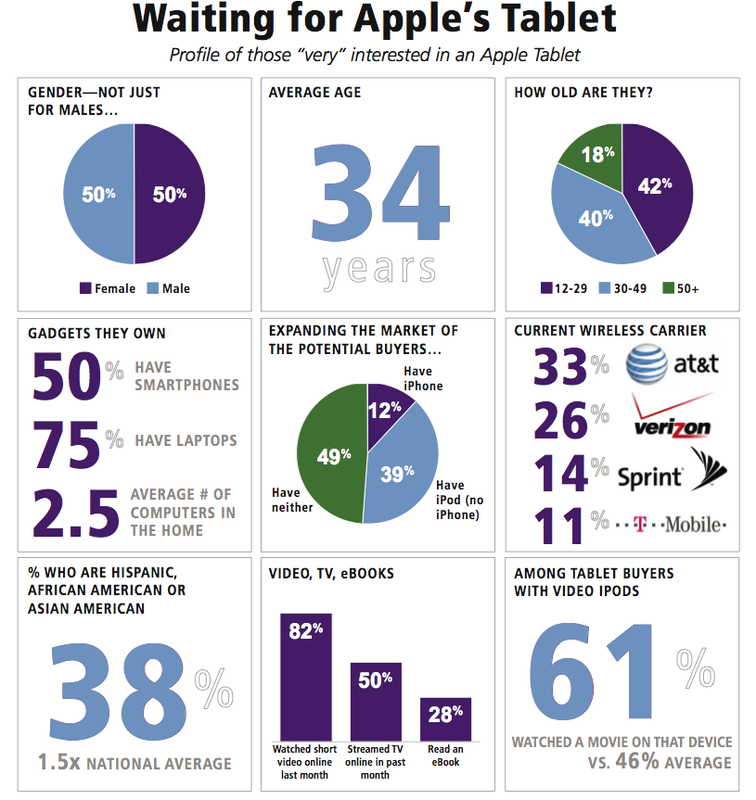 “This age profile is significantly older than the early iPod buyers as well as early iPhone adopters,” says SRG. Price will be a big factor in how successful the device is out of the gate. Now discredited rumors were swirling earlier today that a German retailer had tweeted the price would be €499 (subsidized), €899 (unlocked) and priced in the US between $500-$600 and $1,000 accordingly. The cheapest Macbook is $999. It would be a mistake for Apple to offer the unlocked version of the tablet at that price point. The 64GB iPod Touch is $399 so we know the iPad will fall between those numbers somewhere. If Apple were really going to be smart about pricing it would offer the unlocked tablet at $700 and the subsidized version at $400. Related: The NY Times has an extensive article about the tablet-hopes and dreams of traditional media/publishers and whether consumers will pay for content on the device as they do on the iPhone. Android users are far less willing to pay for apps, partly because the experience isn’t as easy. As I’ve posted about repeatedly people express general unwillingness to pay for content in surveys. However, I suspect that if Apple provides a great device that offers a great experience people will pay. We have only 24 more hours to see what shows up.